A couple of weeks ago we took stock of our deep freezer and I found a packet of Rosti which I had to use soon. 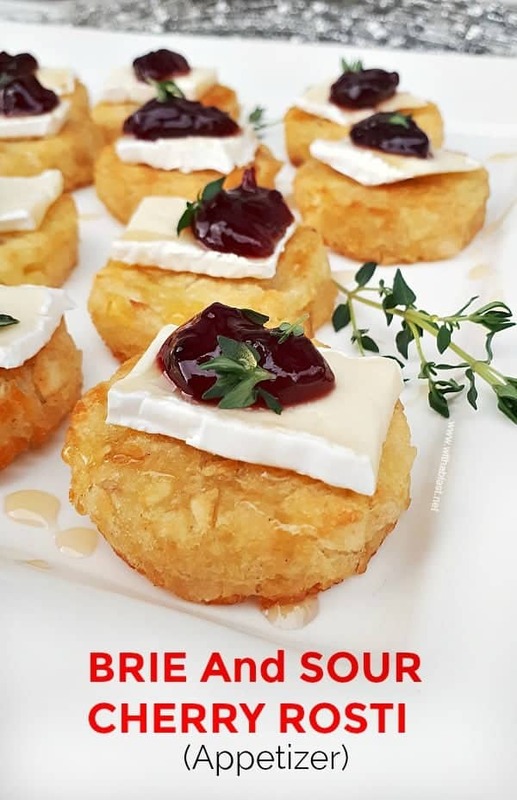 I have been wanting to make a cheese and jam snack as I was craving one for days. Weird how a certain flavor combination can hound you for days, right ? 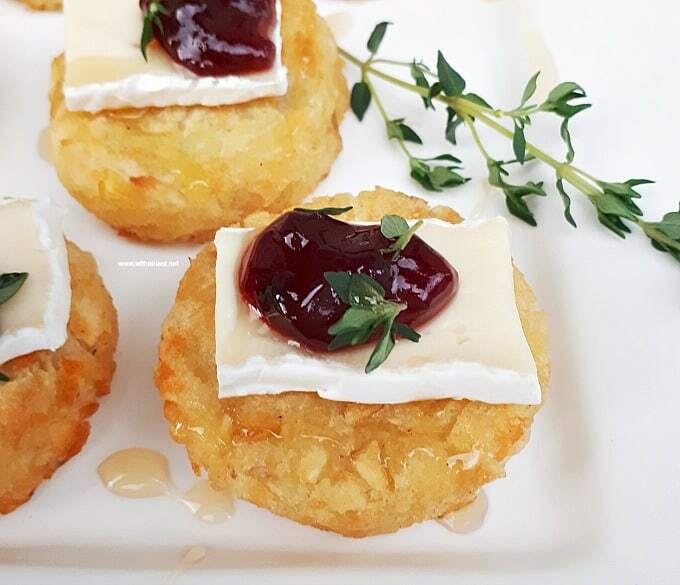 As soon as I noticed the frozen Rosti, I knew I wanted to make my snack and the Brie and Sour Cherry Rosti was born. We had a light dinner the evening I served the Rosti appetizers and it was just perfect. The Rosti is a little more filling than say a savory cracker, but no so much that it will spoil a hungry appetite. Combining Rosti, which is potatoes, with cheese still sounds alright. But add jam and everyone gives you a strange look. 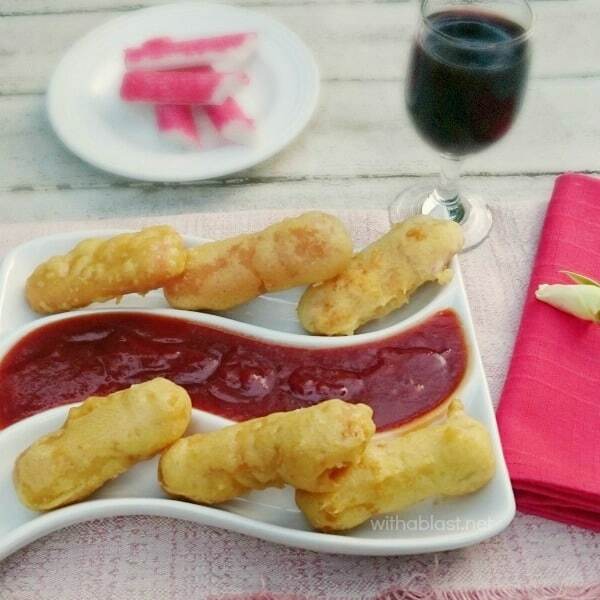 Well, happy to say that everyone fell in love with these appetizers and the plate was finished within minutes. Now, my family knew exactly what I was making, hence to looks ! But your party guests would not know and I am certain that once they have tasted them, your serving plate would not last long as well ! Fig jam, or preserves are normally my go-to companion with Brie Cheese but I found a jar of Sour Cherry Jam at the store the other day which I just could not resist buying. Even though it was a little pricey. But hey, this is the season to be Merry and bright … and eat lots and lots of snacks, sweet and savory. And parties are being thrown just about every second day during December. Not even to mention the first two weeks in January, which we still regard as “the Holiday Season” in South-Africa. Don’t know about your country, but here most of the companies (excluding retail stores etc), only opens for business mid January. Same with schools, depending on the province, some schools only open around the 20th in January. Which takes me back to when my kids were still in school. My favorite way to treat them after a year’s school, final exams and then finally relaxing, were with snacks. Before you judge, not all snacks are unhealthy. I tried to keep a balance, usually on the same get-together or party platters. And parties were in abundance those days ! Their friends came over to visit and before you knew what has hit you, there were a dozen or more hungry kids to feed. 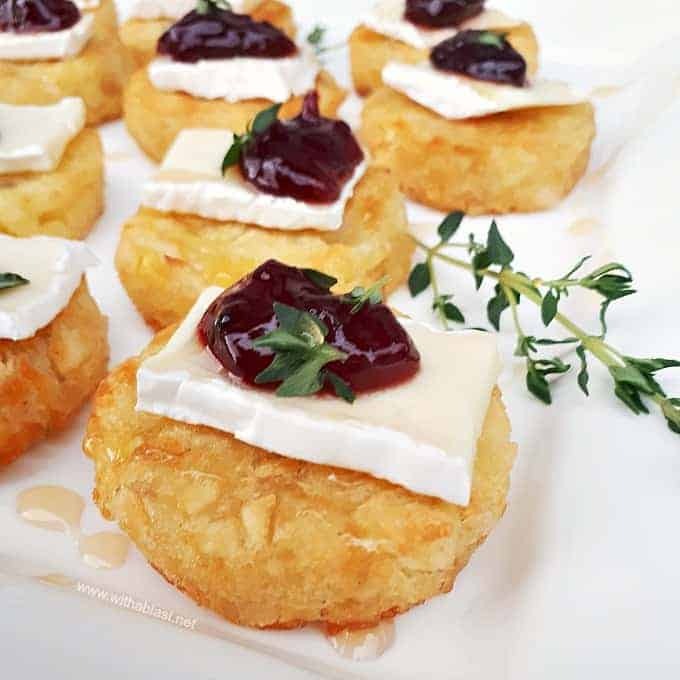 Snacks, like this Brie and sour Cherry Rosti are perfect. Quite filling, not really unhealthy and everyone loves them. Combine a couple of other snacks, both sweet and savory, and teenagers are happy. Now that the kids are older, snacking is not so much a priority anymore, but they do appreciate a good appetizer before dinner. And they most certainly love to party ! Nothing crazy though, a couple of good friends, maybe a braai (barbeque) or a casual dinner. 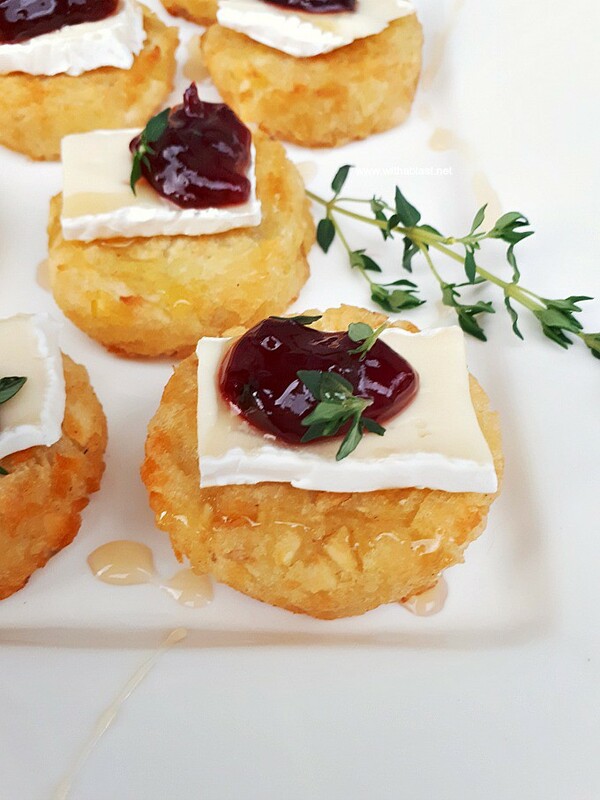 Keep these Rosti appetizers in mind for all your upcoming dinner parties, Christmas and especially New Year. 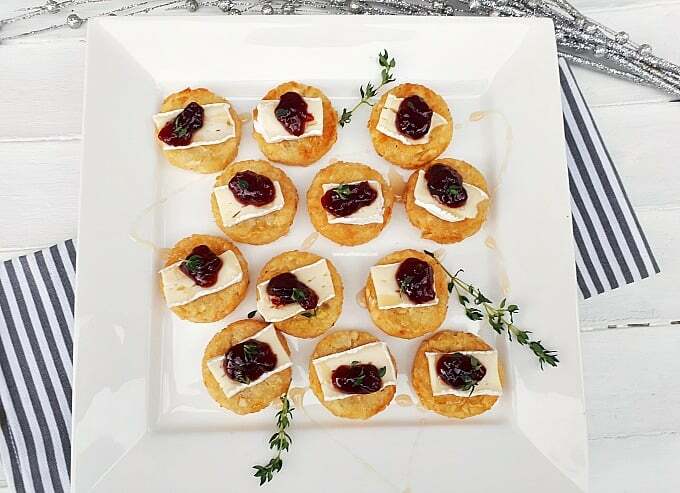 Serve them as an individual appetizer before dinner or as part of a party platter.